Delight your Customers and Patrons by serving Artisan-Roasted coffee from Caffè Amouri, where our ethos is ‘Quality, Sustainability and Community’. We delight in helping you deliver an amazing coffee experience. We don’t want to just supply coffee beans. Our team can help elevate your customers’ coffee experience and advise on how you can get the most out of your coffee program. Training by SCAA certified personnel, operational support and consultation, equipment and work flow advice; your success is our success. 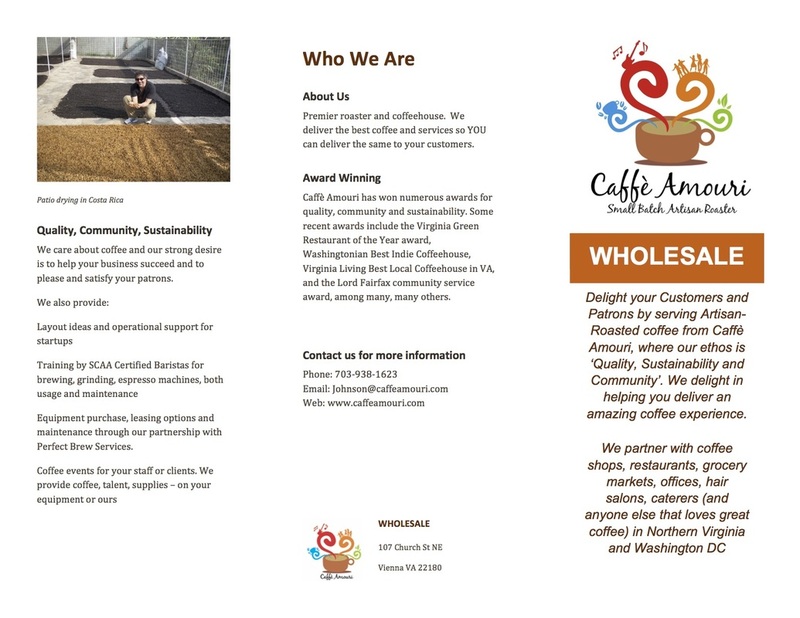 We partner with coffee shops, restaurants, grocery markets, offices, hair salons, caterers (and anyone else that loves great coffee) in Northern Virginia, Maryland and Washington DC. For more information, contact our Sales Manager, Johnson Hsu.